Fund holdings affect fund performance more than fees or past performance. A cheap fund is not necessarily a good fund. A fund that has done well in the past is not guaranteed to do well in the future (e.g. 5-star kiss of death and active management has long history of underperformance). Yet, traditional fund research focuses only on low fees and past performance. Our Robo-Analyst technology empowers our unique ETF and mutual fund rating methodology, which leverages our rigorous analysis of fund holdings and enables investors to find funds with high quality holdings (the best chances for outperformance) – AND – low fees. Investors are good at picking cheap funds. We want them to be better at picking funds with good stocks. Both are required to maximize success. We make this easy with our predictive fund ratings. A fund’s predictive rating is based on its holdings, its total costs, and how it ranks when compared to the rest of the 7000+ ETFs and mutual funds we cover. 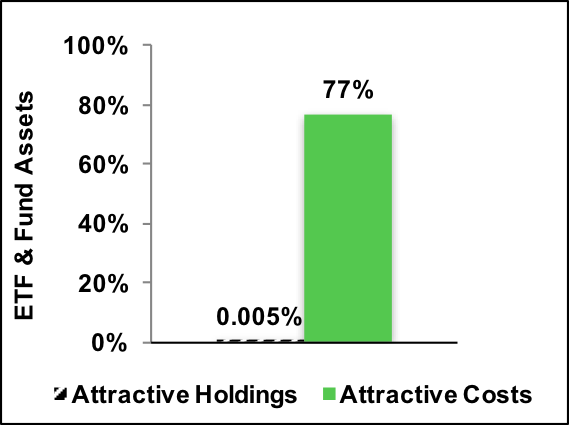 Figure 1 shows that 77% of fund assets are in ETFs and mutual funds with low costs but less than 1% of assets are in ETFs and mutual funds with Attractive holdings. This discrepancy is eye opening. Perhaps, if more investors had access to research on fund holdings, they would allocate to more Attractive-or-better rated funds. More research into the quality of holdings. More allocation by managers to high-quality holdings or good stocks. With about twice as many funds as stocks in the market, there simply are not enough good stocks to fill all the funds. These opportunities are related. If investors had more insight into the quality of funds’ holdings, we think they would allocate a lot less money to funds with poor quality holdings. Many funds would cease to exist. Quality of holdings is the single most important factor in determining an ETF or mutual fund’s future performance. No matter how low the costs, if the ETF or mutual fund holds bad stocks, performance will be poor. Costs are easier to find but research on the quality of holdings is almost non-existent. Figure 2 shows investors are not putting enough money into ETFs and mutual funds with high-quality holdings. Only 11 out of 7994 (<1%) ETFs and mutual funds allocate a significant amount of value to quality holdings. 99% of assets are in funds that do not justify their costs and over charge investors for poor portfolio management. Figure 3 shows that Investors successfully find low-cost funds. 77% of assets are held in ETFs and mutual funds that have Attractive-or-better rated total annual costs, our apples-to-apples measure of the all-in cost of investing in any given fund. Out of the 7994 ETFs and mutual funds we cover, 2212 (28%) earn an Attractive-or-better total annual costs rating. Clearly, ETF and mutual funds investors are smart shoppers when it comes to finding cheap investments. But cheap is not necessarily good. Fidelity MSCI Energy Index ETF (FENY) gets an overall risk/reward rating of Very Unattractive because no matter how low its fees (0.09%), we expect it to underperform because it holds too many Unattractive-or-worse rated stocks. Low fees cannot boost fund performance. Only good stocks can boost performance. Investors should allocate their capital to funds with both high-quality holdings and low costs because those are the funds that offer investors the best performance potential. But they do not. Not even close. Figure 4 shows that 54% of ETF and mutual fund assets are allocated to funds with low costs and high-quality holdings according to our predictive fund ratings, which are based on the quality of holdings and the all-in costs to investors. Investors deserve forward-looking ETF and mutual fund research that assesses both costs and quality of holdings. For example, Vanguard 500 Index Fund (VFFSX) has both low costs and quality holdings. Why is the most popular fund rating system based on backward-looking past performance? We do not know, but we do know that the lack of transparency into the quality of portfolio management provides cover for the ETF and mutual fund industry to continue to over charge investors for poor portfolio management. How else could they get away with selling so many Unattractive-or-worse ETFs and mutual funds? Well, maybe, the industry is not getting away with it anymore given the huge flow of fund away from active to passive management. John Bogle is correct — investors should not pay high fees for active portfolio management. His index funds have provided investors with many low-cost alternatives to actively managed funds. However, by focusing entirely on costs, he overlooks the primary driver of fund performance: the stocks held by funds. Investors also need to beware certain Index Label Myths. Research on the quality of portfolio management of funds empowers investors to make better investment decisions. Investors should no longer pay for poor portfolio management. This article originally published on January 25, 2018.